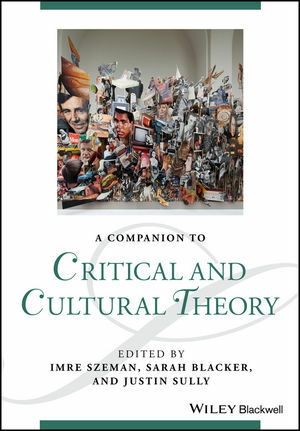 This Companion addresses the contemporary transformation of critical and cultural theory, with special emphasis on the way debates in the field have changed in recent decades. Imre Szeman is a Canada Research Chair of Cultural Studies and Professor of English and Film Studies at the University of Alberta, and adjunct professor of Visual and Critical Studies at the Ontario College of Art and Design University. He is the founder of the Canadian Association of Cultural Studies and a founding member of the US Cultural Studies Association. He is the author or editor of many books, including most recently, Contemporary Marxist Theory: An Anthology (2014), Popular Culture: A User's Guide (3rd revised edition, 2013), After Globalization (Wiley Blackwell, 2011), and Cultural Theory: An Anthology (Wiley Blackwell, 2010). Sarah Blacker is a Postdoctoral Research Fellow at the Max Planck Institute for the History of Science, Berlin, Germany. Located at the intersection of science and technology studies, critical theory, and cultural studies, her research explores the politics of genomic medicine and health disparities' relation to racial inequalities in North America. She is co-editor of the journal Reviews in Cultural Theory. Justin Sully teaches literary and cultural studies at Queen's University, Kingston, Ontario, Canada. His research tracks the cultural history of statistics and the political aesthetics of enumeration in film, television, and digital media. He is co-editor of the journal Reviews in Cultural Theory.